SeizureTracker.com - Vagus Nerve Stimulator - Settings History and Magnet Swipe Tool. 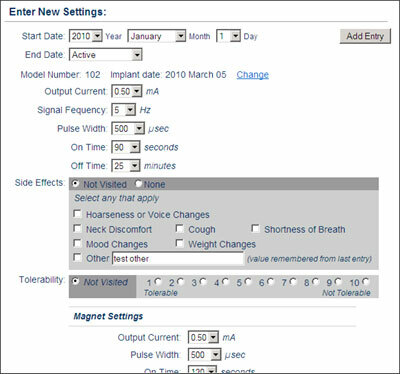 Seizure Tracker Help > Track > VNS Therapy® - Settings History and Magnet Usage Tool. VNS Therapy Description: Maunfactured by Cyberonics®, VNS Therapy is delivered by a generator similar to a pacemaker and a thin wire that stimulates the vagus nerve in the neck. The vagus nerve then sends these pulses to the brain to help control seizures all day, every day. Physicians will adjust the settings to meet the needs of each individual. A handheld patient magnet offers additional seizure control for some people. By briefly holding the magnet over the generator when a seizure is coming on or during a seizure, the seizure may be stopped or shortened in duration or intensity, as well as the recovery period shortened. -If the tool is currently active, you will see the "VNS Therapy Setting Schedule" in the lower left corner of your control panel. -If the VNS Therapy tool is not active, you can visit the "Account Settings" page (accessible through a link on your control panel) and check the "Enable VNS" box. 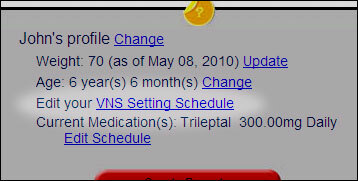 You will now be able to visit "VNS Therapy Setting History" page through the link on your control panel. -Once the VNS Therapy option has been selected on the "Account Settings" page, click the "VNS Therapy Setting Schedule" link on the control panel. 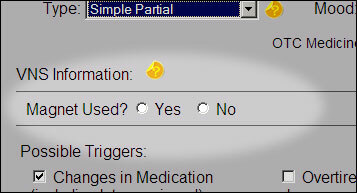 You will be directed to the page with the VNS Therapy form for entering settings. - Side Effects - Including: Hoarseness or Voice Changes, Neck Discomfort, Cough, Shortness of Breath, Mood Changes, Weight Changes, Other. - Magnet Settings - Including: Output Current, Pulse Width and On Time. Added entries will be listed below the form on order by date. VNS Therapy settings will be represented in the graphs and rolling over the anchor points will display the settings for the associated day. Larger anchor points represent a new setting entry. 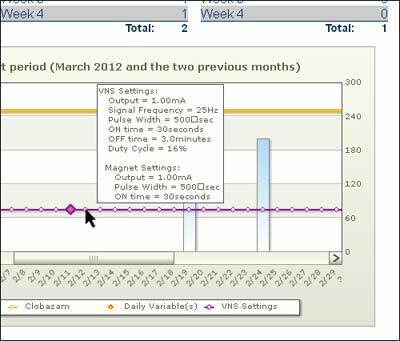 VNS Therapy rollover on report graphs. The Seizure Tracker VNS Therapy tool allows users to record magnet usage and surrounding information when logging a seizure event. *For this tool to be enabled on the events logging page you must first have selected it in the "Account Settings" page and have a setting entry (including the intended logging date) entered in the "VNS Therapy Setting History" page. Both the "Account Settings" page and the "VNS Therapy Settings History" page are accessible through the control panel. Magnet options on the event logging page. -If "Yes" is selected in the "Magnet Used" option more selection options will appear. If the tool is active on the event logging page and this section is not answered the event list will read "Magnet Used: Not Answered". Options when "Yes" is selected. -Information collected when magnet used is selected include: "How many times used? ", "Used by? ", and "Did the magnet stop the seizure?" -If "No" is selected for the "Did the magnet stop the seizure?" question two more question will be asked. 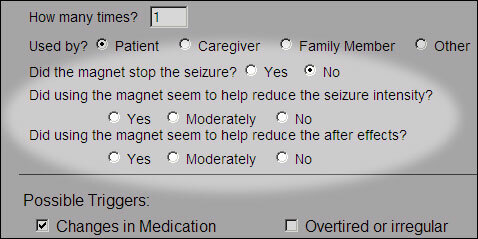 They include: Did using the magnet seem to help reduce the seizure intensity? and "Did using the magnet seem to help reduce the after effects?". Options appear when magnet did not stop the seizure. Once the seizure event is recorded it will appear in the event list at the bottom of the page and will include all magnet information selected. Visit the Cyberonics® website for more information on VNS Therapy.